The David Letterman episode during which Donald Trump displayed his new line of shirts and ties showed a bit of hypocrisy. He ranted to Letterman that China is killing America with its unfair trade practices. He said he would vote for Romney who would take change and stop this nonsense. 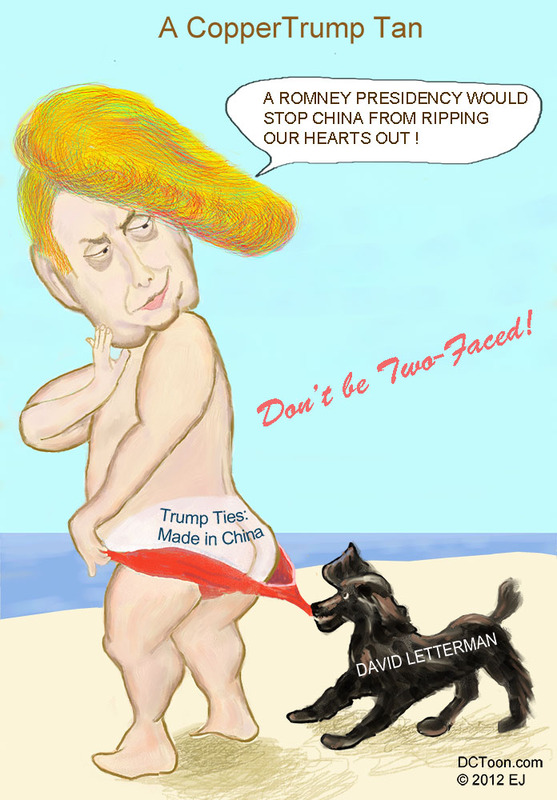 Letterman looked at the tags on Trump’s line and pointed out the “made in China’ labels. This cartoon uses an old Coppertone-like ad to capture that moment. This entry was posted in Celebrities, Economy, International and tagged Cartoon, China, EJ, Letterman, Ties, Trump by EJ. Bookmark the permalink.